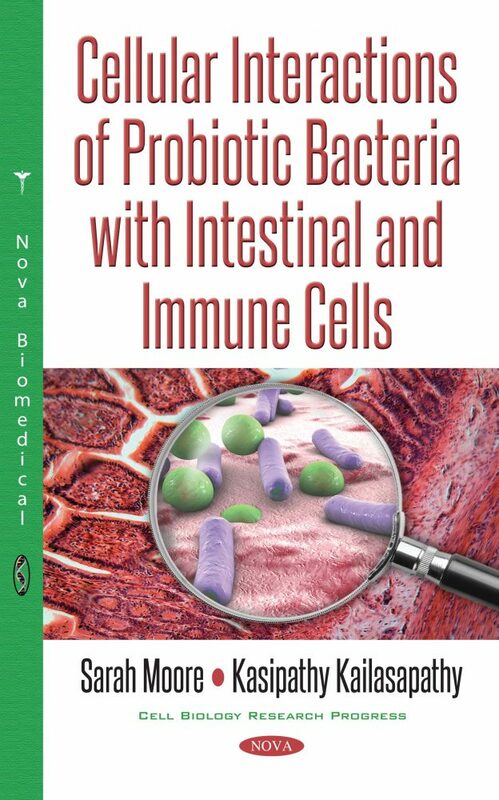 This book contains novel research and laboratory techniques to study the immune cell molecular behaviour and responses to soluble factors produced by probiotic bacteria and intestinal/probiotic co-cultures that will contribute to advanced scientific knowledge and the commercial development of probiotics. Such understanding will allow scientists to identify new probiotic strains with enhanced immunomodulatory effects, ascertain minimal probiotic dose requirements, distinguish the type of immunological response to probiotics and identify potential probiotic soluble factors that induce immunological reactions. This book includes recent techniques involved in the use of adaptive immune cells with intracellular expressed fluorescent proteins acting as bio-indicators of responses to soluble factors produced by probiotic strains and intestinal/probiotic co-cultures. Research techniques on the immune cell response to the microencapsulated probiotics is described as a downstream indicator to determine changes in the behaviour of the confined probiotics. Changes in probiotic bacterial-activities from the microencapsulated environment have rarely been reported and are evaluated in this book using the transfected porcine progenitor immune cells as a downstream indicator. To date, no studies have reported any form of immunological responses (innate or adaptive) to microencapsulated probiotic bacteria. These results are compared to the responses of immune cells treated with non-microencapsulated probiotic bacteria. This book also contains advanced fluorescence microscopy techniques to obtain real-time information from viable cells. Fluorescent proteins have been widely used as bio-indicators of cellular responses. The porcine progenitor immune cells can be transfected with the fluorescent proteins, phMGFP and pCIneo-DsRed2. Changes in fluorescence and diffusive properties of these fluorescent proteins in response to the probiotic bacterial-produced soluble factors can be imaged by LSCM and FCS, and analysed using the RICS program. These changes can be compared to the immune cellular responses to pathogen-produced soluble factors (Streptococcus pyogenes). The intracellular responses of the immune cells to the probiotics and pathogen are compared to determine if the probiotic strains exhibited similar effects on immune cellular responses. Ahmad, N., Drew, W. L. & Plorde, J. J. (2010) Sherris medical microbiology, New York, USA, The McGrath-Hill Companies. Bowman, S. (2008) Developing a model to characterise progenitor cell specific gene therapy. College of Health and Sciences. Hawkesbury, Australia, University of Western Sydney. Cencic, A. (2010) The prosperous future in gut research - functional cell models of the GIT. International Scientific Conference Probiotics and Prebiotics. Kosice, Slovakia. Ciorba, M. A., Riehl, T. E., Rao, M. S., Moon, C., Ee, X., Nava, G. M., Walker, M. R., Marinshaw, J. M., Stappenbeck, T. S. & Stenson, W. F. (2011) Lactobacillus probiotic protects intestinal epithelium from radiation injury in a TLR-2/cyclo-oxygenase-2-dependent manner. Gut, Epub. Claxton, N. S., Fellers, T. J. & Davidson, M. W. (2006) Laser scanning confocal microscopy. http:www.olympusfluoview.com/theory/LSCMIntro.pdf. Cotran, R., Kumar, V. & Collins, T. (1999) Robbins pathological basis of disease, Philadelphia, PA, WB Saunders. Elgert, K. D. (1996) Immunology. Understanding the immune system, New York, Wiley-Liss Inc.
Ewing, W. N. & Cole, D. J. A. (1994) The Living Gut: an introduction to micro-organisms in nutrition, Ireland, Context Publication. FAO/WHO (2001) Joint FAO/WHO expert consultation on evaluation of health and nutritional properties of probiotics in food including powder milk with live lactic acid bacteria. FAO/WHO (Food and Agriculture Organization/World Health Organization). Cordoba, Argentina: WHO: 2001. Fuller, R. (1992) Problems and prospects. IN FULLER, R. (Ed.) Probiotics, the scientific basis. London, Chapman & Hall. Haugland, R. P. (2005) The Handbook: a guide to fluorescent probes and labeling technologies, Chicago, USA, Invitrogen Molecular Probes. Havenaar, R., Brink, B. T. & Huis In't Veld, J. H. J. (1992) Selection of strains for probiotic use. IN FULLER, R. (Ed.) Probiotics: The scientific basis. London, UK, Chapman & Hall. Holt, J. G., Krieg, N. R., Sneath, P. H. A., Staley, J. T. & Williams, S. T. (1994) Bergey's manual of determinative bacteriology, Maryland, USA, Williams & Wilkins. Kailasapathy, K. (2008) Formulation, administration, and delivery of probiotics. In Versalovic, J. & Wilson, M. (Eds.) Therapeutic microbiology: probiotics and related strategies. Washington, DC, USA, ASM Press. Kailasapathy, K. & Godward, G. (2001) Micro-encapsulation of probiotic bacteria with alginate-starch and evaluation of their survival in dairy products. International Congress of Probiotics Medicine. Los Angeles, California. Kindt, T. J., Goldsby, R. A. & Osborne, B. A. (2007) Kuby Immunology, New York, USA, W.H. Freeman and Company. Kodama, M., Sekiguchi, K., Kubo, M., Mitani, K., Osada, M., Sonoda, A., Kashiwazakmi, M. & Saitot, T. (1981) Abstract. 92nd Meeting Jpn Soc Vet Sci. Lenser, T., Weisshart, K., Ulbricht, T., Klement, K. & Hemmerich, P. (2010) Fluorescence fluctuation microscopy to reveal 3D architecture and function in the cell nucleus. IN SHIVASHANKAR, G. V. (Ed.) Nuclear mechanics and genome regulation. Amsterdam, Netherlands, Elsevier/Academic Press. Low, B. C. & Gong, Z. (2005) Reporter gene system: green fluorescent protein. In Meyers, R. A. (Ed.) Encyclopedia of Molecular Cell Biology and Molecular Medicine. 2nd ed. Weinheim, Wiley-VCH Verlag GmbH & Co. KGaA. Mak, T. W. & Saunders, M. E. (2008) Primer to the immune response, London, UK, Academic Press. Male, D., Brostoff, J., Roth, D. B. & Roitt, I. (2006) Immunology, USA, Mosby. Mccabe, B. K. (1998) Production of cellulolytic enzymes using immobilised anaerobic fungi. Faculty of Business and Technology. Macarthur, NSW, Australia, University of Western Sydney. Mcelroy, M., Bouvet, M. & Hoffman, R. M. (2008) Color-coded fluorescent mouse models of cancer cell interactions with blood vessels and lymphatics, San Diego, California, Academic Press. Metchnikoff, E. (1907) Lactic acid as inhibiting intestinal putrefaction. The prolongation of life. Optimistic studies. Heinemann. Müller-Taubenberger, A. (2006) Application of fluorescent protein tags as reporters in live-cell imaging studies. In Eichinger, L. & Rivero, F. (Eds.) Methods in Molecular Biology: Dictyostelium discoideum Protocols. Totowa, NJ, Humana Press Inc.
O'grady, B. & Gibson, G. R. (2005) Microbiota of the human gut. In Tamime, A. (Ed.) Probiotic Dairy Products. Blackwell Publishing Ltd.
Parham, P. (2009) The body's defenses against infection. In Parham, P. (Ed.) The immune system. 3rd ed. New York, USA, Garland Science, Taylor & Francis Group. Ravishankar, S. & Juneja, V. K. (2000) Sodium chloride. IN NAIDU, A. S. (Ed.) Natural food antimicrobial systems. Florida, USA, CRC Press. Russell, J. B., Onodera, R. & Hino, T. (1991) Ruminal protein fermentation: new perspectives on previous contradictions. IN TSUDA, T., SASAKI, Y. & KAWASHIMA, R. (Eds.) Physiological aspects of digestion and metabolism in ruminants: proceedings of the seventh international symposium on ruminant physiology. San Diego, California, Academic Press, Inc.
SAINSBURY, B. I. (2008) A study of the bioimaging applications of a novel red fluroescent protein isolated from a reef coral. College of Health and Science. Hawkesbury, Australia, University of Western Sydney. Sherley, J.L. & Taghizadeh, R.R. (2008) CFP and YFP, but not GFP, provide stable fluorescent marking of rat hepatic adult stem cells. Journal of Biomedicine and Biotechnology, (1), art. no. 453590. Simpson, S. & Wetzler, L. M. (2004) Mucosal Immunity. In Pier, G. B., Lyczak, J. B. & Wetzler, L. M. (Eds.) Immunology, infection, and immunity. Washington, D.C., USA, ASM Press. Sperti, G. S. (1971) Probiotics, Westpoint, CT, USA, Avi Publishing Co.
Strober, W., Fagarasan, S. & Lycke, N. (2005) IgA B cell development. In Mestecky, J., Lamm, M. E., Mcghee, J. R., Bienenstock, J., Mayer, L. & Strober, W. (Eds.) Mucosal Immunology. 3rd ed. Boston, Elsevier Academic Press. Tannock, G. W. (1999) A fresh look at the intestinal microflora. In Tannock, G. W. (Ed.) Probiotics - a critical review. UK, Horizon Scientific Press. Uematsu, S. & Akira, S. (2004) Toll-like receptors (TLRs) and their ligands. In Bauer, S. & Hartmann, G. (Eds.) Toll-like receptors (TLRs) and innate immunity. Berlin, Heidelberg, Springer. This book is ideally suited for researchers in food and pharmaceutical industries and universities as well as for postgraduate students in microbiology and immunology. This book is a suitable research and teaching text book for advanced microbiology, bacteriology and immunology and is highly recommended for university and research institution libraries around the world.